You’d think that the comfiest saddle would be the softest—a plush, wide cushion of a thing that caressed your buttocks. Unfortunately, that’s actually the opposite of what you want. Perhaps the most common solution to this is a Brooks. 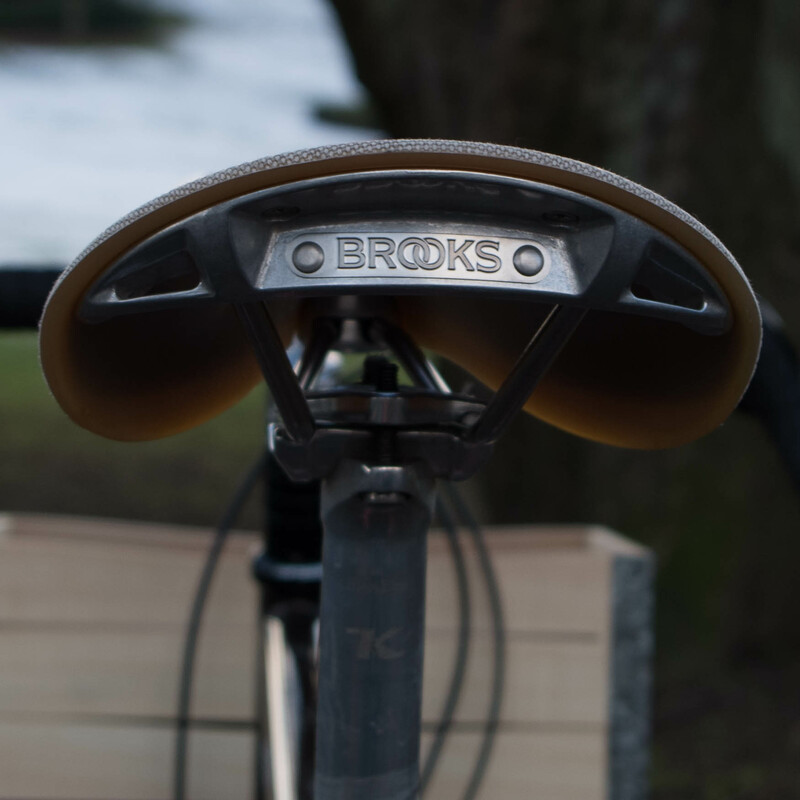 As British as a dreadnought (and of similar weight), Brooks leather saddles provide armchair levels of comfort if you’re going to be on your bike for long periods. 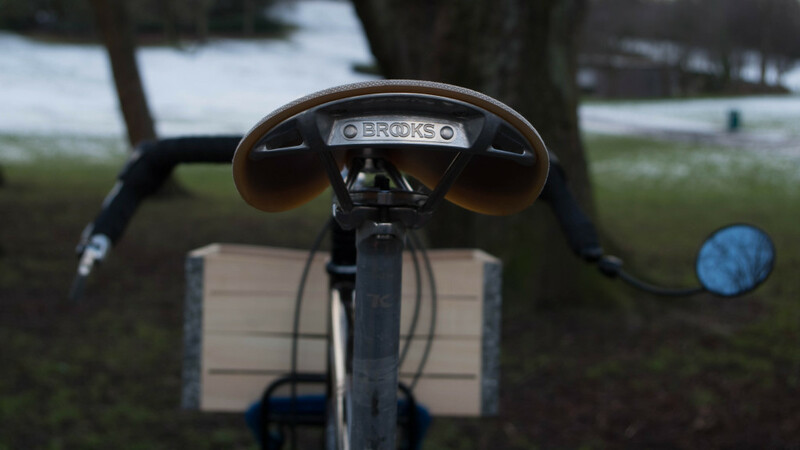 The Brooks Cambium is a rubber saddle, trying to give you that broken-in leather level of comfort without the painful few months at the beginning. 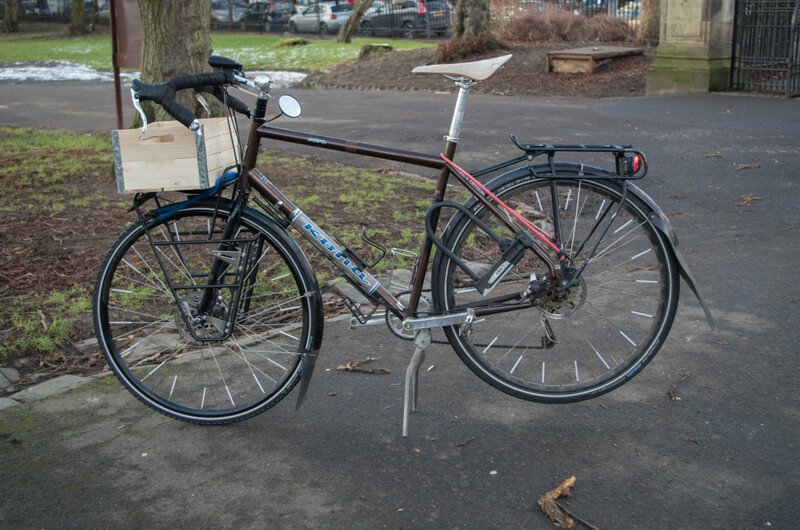 Willy Bain at bicyclerepair.co.uk has a pair of Cambiums available to try, and was kind enough to lend me this one for a week to try out. You’ve got a fairly standard Brooks metal undercarriage to the saddle, although without a tensioning bolt at the front. 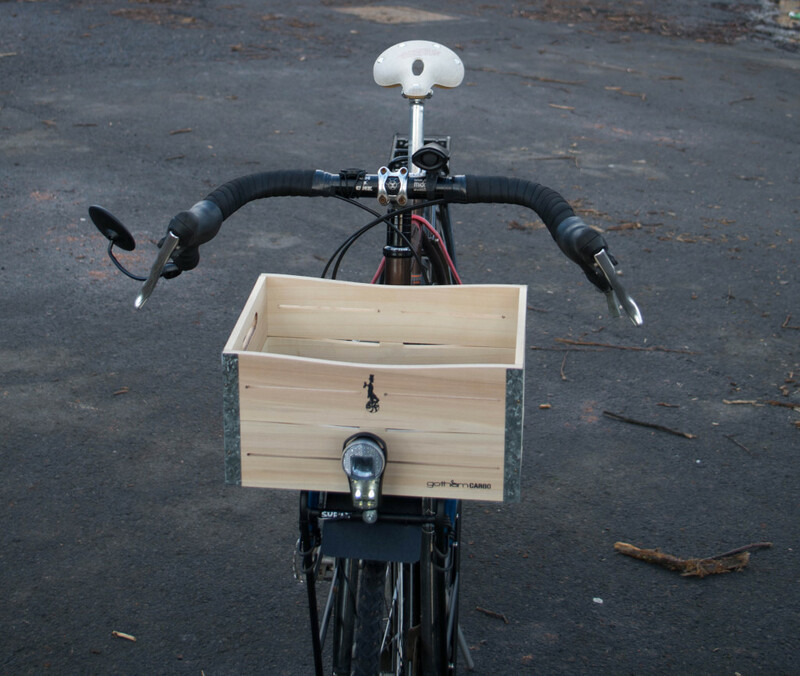 The saddlebag loops are neatly built into the body, rather than hanging below. Undeniably a thing of beauty. Particularly without my backside above it. The saddle itself is a thick layer of rubber with a fabric upper surface. Brooks say the cotton has been treated to protect from the weather, claiming “practical indestructability”. I think it’s unlikely to last quite as long as a good slab of cow, but I’m sure you’ll get your money’s worth out of it. There’s a central oval cutout from the top that presumably gives the thing some flex. This shot is mainly a chance to show off my amazing wooden box. But you can see the saddle cutout as well. The natural colours would look superb with some gumwall tyres. It looked a little weird on my black-and-brown touring tank, but not obnoxiously so. And I do like that back end. 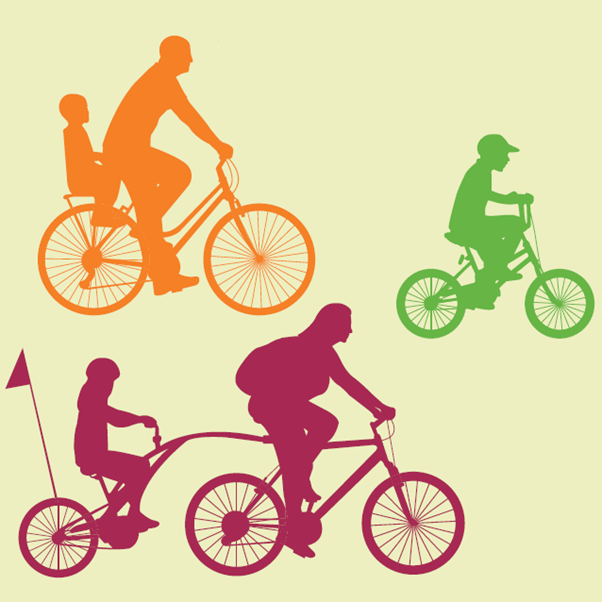 I’d like to be very clear – the perfect alignment of crank and chainstay was accidental. You know I don’t take that much care over photos. Yup, from first use, it’s almost as good as my leather B17. Given that B17 has been on the bike for four years and is thoroughly moulded to my backside, that’s pretty high praise. If you like a “normal” Brooks, you’ll get on fine with the Cambium. If you haven’t tried either; you’re missing out. But should I buy it? Firstly, I didn’t really have to break in my leather Brooks. It was fine out of the box, and just got better with age—the months of anguish reported by some others just didn’t happen. As such, it’s tricky to recommend the Cambium if you haven’t already tried the cheaper leather options. Finally, it’s pricey. You can get the leather B17 for around 85 quid if you shop around (still expensive, I grant you! ), but the Cambium is £115 at Evans, and not in stock anywhere else at the moment. 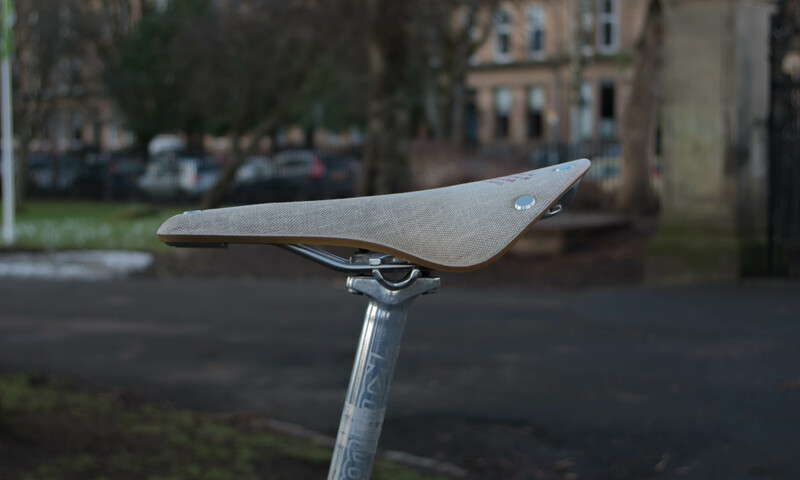 Given all that, unless you’ve already tried a virgin leather saddle and found it agony, I reckon the Cambium could only be described as an indulgence. You’ll find no judgement here. PS: You may have noticed a slight increase in the quality of photographs used in this post (if not an increase in actual photographic skill). I got a new camera for Christmas. PPS: Cambium (noun): layer of actively dividing cells between xylem (wood) and phloem (bast) tissues that is responsible for the secondary growth of plants. Take ten points if you already knew. I find this kind of thing oddly fascinating. Look at them go! Ahem… Anyway, first snow of the winter, so still on the spikey-tyred upright. Mainly slush, so only real issue is hidden potholes. Dug the helmet out of the cupboard for a bit of extra warmth and muppetry insurance.